It’s almost Halloween! In our recent posts we’ve been delving into why some of us are so drawn to the supernatural, the paranormal and the scaring the pants off terrifying. In today’s post we hurl ourselves once more into the realm of the supernatural. A twice look at terror, as it were. One particularly persistent meme in the age-old canon of fright is that of seeing double. Embedded in literature, ancient art, drama and film (celluloid throughout the decades and across cultures has provided some fiendish depictions), the experience of seeing your own self or discovering the existence of another “you” is an enduring motif. We wanted to examine this timeless theme of doppelgangers or duplicate spirits, so with this post we’re turning to our partner, Ancient Origins, and their exploration of what happens when we see double. By the way, if you think doppelgangers are the stuff of mythology and thriller movies, don’t miss the article in the Lesson Plan on how today’s researchers are using “doppelganger” avatars to change behaviors and alter memories in humans. The Lesson Plan that follows the post below is crafted as an adjunct to the social studies programs currently used in the United States and correlates with the National Curriculum Standards for Social Studies. All materials are produced to enable teachers to address different ways of learning in children, particularly those with learning challenges. The mythology of spirit doubles can be traced back thousands of years and was present in many cultures of the past, holding a prominent place in ancient legends, stories, artworks, and in books by various authors. Perhaps the most well-known reference to spirit doubles or ‘alter egos’ is the doppelgänger, a word still used today to refer to a person that is physically or behaviourally similar to another person. Doppelgänger is a German word many “double goer” and refers to a wraith or apparition that cast no shadows and is a replica or double of a living person. They were generally considered as omens of bad luck or even signs of impending death – a doppelgänger seen by a person’s relative or friend was said to signify that illness or danger would befall that person, while seeing one’s own doppelgänger was said to be an omen of death. Some accounts of doppelgängers, sometimes called the ‘evil twin’ suggests that they might attempt to provide advice to the person they shadow, but that this advice can be misleading or malicious. They may also attempt to plant sinister ideas in their victim’s mind or cause them great confusion. For this reason, people were advised to avoid communicating with their own doppelgänger at all costs. How They Met Themselves, Dante Gabriel Rossetti. Pen and Ink brush version. 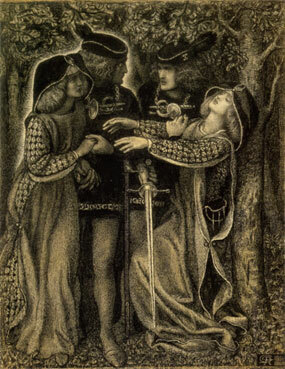 One of the most famous depictions of doppelgängers comes from the 1851 sketch and 1864 watercolour called ‘How They Met Themselves’ by Dante Gabriel Rossetti. According to interpretation, two medieval lovers are walking through the woods at twilight when they encounter their doubles who glow supernaturally. The man draws his sword in astonishment, while his lover appears to collapse in a deathly swoon. Doppelganger imagery occurred in poems Rossetti admired such as Elizabeth Barrett Browning’s The Romaunt of Margaret and Poe’s Silence. While Doppelgänger cases are said to be works of fiction, there are a number of real-life cases in which individuals claim to have met their sinister duo. Among the most noteworthy is Abraham Lincoln’s experience, as chronicled by Noah Brooks in his book Washington in Lincoln’s Time (1895). According to his account, soon after Lincoln was elected in 1860, he arrived home one day and looked into the bureau mirror where he saw himself reflected in double. Lincoln said, “…nearly at full length; but my face had two separate and distinct images.” Lincoln noticed that although the images were nearly identical, one was “a little paler—say five shades—than the other”. His wife was said to be very worried and told Lincoln she believed that the paleness of half the dual image was a bad omen, which meant that Lincoln would serve his first full term, but would not live to finish his second. The subject of the double has a long history, particularly in literature. In Greek mythology Narcissus falls in love with his reflection, and in Gothic tales such as Edgar Allan Poe’s William Wilson (1839), James Hogg’s Private Memoirs and Confessions of a Justified Sinner (1824), Elizabeth Gaskell’s The Poor Clare (1856) and even Hans Christian Andersen’s lesser-read fairy-tale The Shadow, characters are haunted and followed by their often malevolent likenesses. However, the mythology of spirit doubles have far more ancient origins. 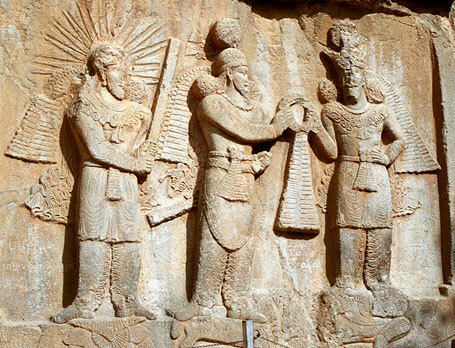 One of the earliest references may be in the Zurvanite branch of Zoroastrianism. This sect distilled the general abstract duality of Zoroastrianism into a concept of manifest twins “born” of a monist “Time.” In this cosmological model, the twins Ahura Mazda (Ormuzd) and Angra Mainyu (Ahriman) were co-eternal representatives of good and evil. In Ancient Egyptian mythology, a ‘ka’ was a tangible “spirit double” having the same memories and feelings as the person to whom the counterpart belongs. In one Egyptian myth entitled, The Greek Princess, an Egyptian view of the Trojan War, a ka of Helen was used to mislead Paris of Troy, helping to stop the war. Norse folklore describes entities known as vardøger, ghostly beings that preceded their living counterparts, taking their places at various activities and performing their actions in advance. The spirit with the subject’s footsteps, voice, scent, or appearance and overall demeanour precedes them in a location or activity, resulting in witnesses believing they’ve seen or heard the actual person before the person physically arrives. This bears a subtle difference from a doppelgänger, with a less sinister connotation. 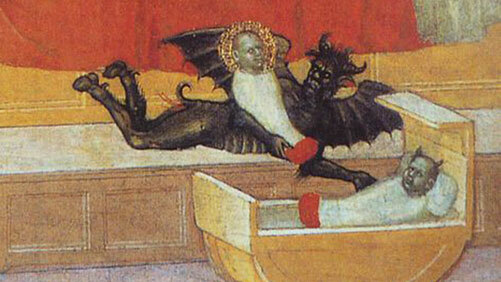 Depiction of a trow replacing a baby with a ‘changeling’. People from the Orkney Islands in Scotland feared small, fairy-like creatures called “trows”. According to legend, trows would give birth to children who were apt to be sickly. Pregnant women were carefully guarded from the trows who would often steal healthy human babies and replace them with their own children, known as ‘changelings’, who would transform into exact replicas of the stolen children. Many Native American creation myths likewise provide for the role of dualistic twins. Hopi legends refer to the twins who were called the Child of the Sun and the Child of the Water. The Hopi also believe in duality between the Upper World and the Underworld: that whatever is happening here in the Upper World, the opposite is happening in the Underworld. So where did belief in spirit doubles come from and is there any real truth to them? While many today still belief in the existence of a double self, some scientists believe the phenomenon occurs based on injuries or stimulation to certain parts of the brain which cause errors in spatial reasoning. Others believe it is the result of a vision, hallucination, or that we live in a parallel universe in which everything in this world in replicated in another dimension. Whatever the real truth behind doppelgangers, belief in the spirit double has instilled both fear and wonder in people for thousands of years. Doppelganger – Crystalinks. Available from: http://www.crystalinks.com/doppelganger.html. Concept– Research general concepts of self and ego from psychological literature. Activity– Write key research points on the psychological explanations for why some people believe in a spirit double. Concept– Explore why face recognition is actually difficult for humans. Actvity– Make a list of all the things that influence how we perceive another person’s appearance. Concept– What can you imagine could be the good coming from having a doppelganger? What could be the unintended consequences? Materials– Research articles about how changing events in history can affect the future. Activity– Use your own imagination to write about changing an event in history. How would life today be affected? Concept– What would happen if your doppelganger were more accomplished than you? If he/she had a questionable character? Think about what elements of your separate pasts could make those differences in your lives. Activity– Make a list of your traits, both positive and negative. What would be the consequences of having a doppelganger with the same traits but in different proportions than yours? Draw a line chart to explore the different paths your doppelganger might take in life. How do these paths differ from where you are and where you plan to be? Activity– How can you envision avatars being used to improve lives? Concept– Think about what it would be like to have a doppelganger. What would you say to your double when you first met? Would you want a relationship? What if you liked the person? Disliked him/her? Materials– Notes from the activities above and your imagination. 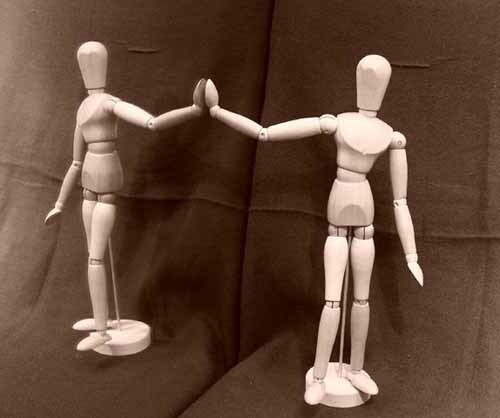 Activity– Write a short story about what happens when a person discovers the existence of his/her doppelganger. This entry was posted in Ancient Origins, Blog, Culture, Holidays, Literature, Psychology, Public Life, Religion, Science and Technology and tagged ancient doppelgangers, ancient folklore, Ancient Origins, AntiquityNOW, doppelgangers, Egyptian mythology, Halloween, Native American mythology, Norse mythology, spirit doubles. Bookmark the permalink.